This is my image from the latest DSFDF challenge. I tried to find my own point of view for this. It wasn't easy because every time I checked to see what the others had done, they were so good and had many great interpretations. So for our next challenge, either I get on it as soon as I get the challenge or don't look to see what the others have done (and that is the fun part!) until I finish mine. This was supposed to be a quick study (8x9ish) but I ended up working on it more and will go back to change a few things to finish it. ----update--- The bottom was the origional watercolor. I didn't just retouch the skin tone, I redid the image using titatnium white and color washes. It ended up a bit washed out but fun to play with the color and to see the difference it can make. The top was a quick 8x10 in acrylic. This was my quick watercolor demo from my class today. I put different colored apples and pears under strong light on a dark ground and had the students compose a painting. Some did only one fruit, some did three and again, they were pretty successful with the results. I chose to do my yellow apple times three. I work pretty fast on the demos and usually won't go back to change anything even if there is a spot just screaming at me to adjust. Arghhhhh! I was happy to see that we had an evening painting to do fo DSFDF. Jefferson Memorial was a quick painting and is about 10x7 inches. I enjoyed doing another evening painting this fall from the Butler Farm Show. When one of my sons was young he looked out the window at dusk and said, "Look, it's darking!" I have alot going on right now. It is good, but it will take me awhile to get up to speed on the blog. 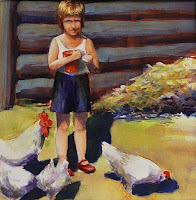 I have a show (Painting Simple Moments) at the Bottlebrush Gallery and Shop in Harmony, PA till mid January. http://www.bottlebrushgallery.com/ I am doing a few workshops in conjunction with the show and the first one in December was great. I had a nice group of kids and they went home with some nice pieces to use as gifts. The adult workshop is next week and is almost full. I am also doing a floral watercolor workshop in the greenhouse at Quality Garden Center in February. They are getting the info on their website soon but in the mean time I thought I would mention it here. I took my class on a field trip to paint there last month and it was so nice. Pointsettas, and lush green all around. 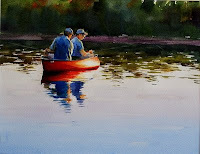 The image of the Red Canoe is in the show at the Bottlebrush and was featured in the Butler Eagle newspaper today. The image of the Cosmos will be featured in the web ad and newsletter for the workshop at Quality Gardens. I am pretty lucky that I have my classes to teach. I continually get to go over the basics (that we often forget) and I am able to do demos to show the techniques I am teaching. Today, I had a new student who was interested in watercolor. The rest of the class was interested in trying acrylic since they had been painting with watercolors since fall. So I chose a simple subject, strong light and some texture. My watercolor demos went well and I ended up with one strong colored and the other alittle muted. The acrylic demo was great fun and the students also did some nice work. It is always a good day when the students dive in and end up with work they are proud of. So, here are my oranges, oranges, oranges, 1, 2 and 3.